LOS ANGELES - It's good to play at home. This is the theme for Carsten Ball of Newport Beach, Sam Querrey of Santa Monica, and the Bryan Brothers of Camarillo. All of these players reside in Southern California and have successfully made it to the semifinal day at the LA Tennis Open. Qualifier Carsten Ball (AUS) beat 77th ranked John Isner 6-4, 6-4. Isner took a fall on Thursday that left him favoring his ankle and unable to bring his best game. Ball kept his head in a closely contested match and took advantage of Isner with solid passing shots to clinch his spot. Ironically, his second round opponent, Dmitry Tursonov (RUS) also sustained an ankle injury and retired. This is the best result for 22 year old Carsten Ball. He is ranked 205th on the ATP World Tour. He is usually found playing the Challenger circuit. He made it through three rounds of qualifying and defeated Donald Young for the main draw entry. American Mardy Fish pulled out of the tournament citing a reoccurrence of an oblique muscle injury. 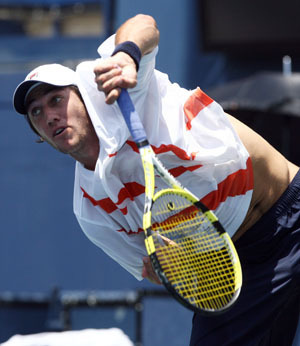 22 year old Leonard Mayer of Argentina received the walkover. He will meet Carsten Ball in the first semifinal match. Local favorite Sam Querrey defeated Dudi Sela (ISR) 6-3, 7-5 to move into the semifinals. He served nine aces with 93% of his first serves won. He didn't face any break points. Querrey will play first seed Tommy Haas for a third consecutive final appearance in as many tournaments. Querrey is currently ranked 32 in the world and is the fourth ranked American behind Andy Roddick, James Blake, and Mardy Fish. He is currently in second place in the US Open Series. The Bryan brothers secured the first spot in the doubles final. This will be their fifth final appearance at this tournament. They were champions in 2001, 2004, 2006, and 2007.The Bryan twins will play the winners of the Benjamin Becker (GER) / Frank Moser (GER) vs Denis Istomin (UZB) / Leonardo Mayer (ARG) match.